Trip to the seaside and fancy a good old ice-cream? Check out our sticky-fingered guide to the best cold stuff on the coast. 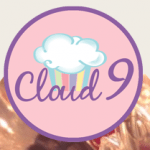 Brighton is lucky enough to have two branches of Cloud 9, the first cake shop in the UK to make the famous Rainbow cake. Not only do they do they do the most amazing cakes, including a phenomenal selection of cupcakes, Cloud 9 is also known for it’s delicious house-made ice-cream. With 16 flavours at any one time, rotating a total of 100 flavours, there’s certainly plenty to choose from. 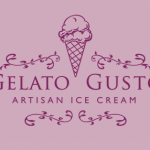 A premium Italian ice-cream parlour, the elegant Gelato Gusto uses fresh milk from a local Sussex dairy. 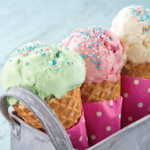 Creating gelato rather than ice-cream which is lower in butterfat as it’s made with milk not cream, kept at a slightly higher temperature and made daily in small batches. The result? A richer, creamier and gooier ice cream. With up to 30 flavours to choose from at any one time, you’ll have to keep going back for more. 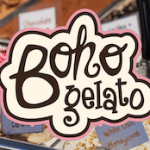 Part micro factory, shop and cafe, award winning Boho’s offers 24 flavours at any one time, from a growing list of 400! These flavours range from Vanilla to Violet, Mango to Mojito and Apple to Avocado. From the classic to the unusual. Offers vegan options too. As well as gelato, Boho’s does desserts, waffles and milkshakes. They source their ingredients from local farmers and suppliers. 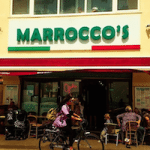 Marocco’s is an Italian seafood restaurant on Hove seafront who have also been making ice-cream since 1969. Still made by the same family, in the same expert way. This is probably why Marocco’s have many customers who are fourth generation sampling one of Hove’s long standing traditions. 24 flavours to choose from and a Hove stalwart. Perfect for a seaside stroll. 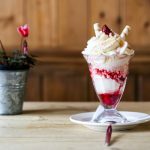 Established in 2007 award winning Scoop and Crumb is a traditional ice cream parlour with a twist. 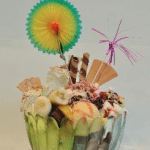 Not only selling an exciting range of rich and creamy ice-creams and sharp and sour sorbets, it also known for having the largest ice cream sundae selection in the UK with over 55 different ways to take ice cream to the next level. Savoury menu also as well as Scandinavian groceries. Established in 1862, the World Famous Pump Room is somewhat of an institution in Brighton. It’s original purpose was to provide sea water to the Grand Hotel. Each room in the iconic hotel has three taps: one for hot water, one for cold and one providing sea water from the pump room. 16 flavours of ice cream made by a local farmer. Mather’s is a new and welcome addition to the fast developing London Road. Situated in the new, eclectic Open Market, they specialise in traditional ice creams, gelatos and sorbets made on the premises with organic, locally sourced produce. They also offer delicious coffee, a range of home-made waffles, beautiful handmade confectionary which make stunning gifts. Real Italian gelato served by real Italian people. 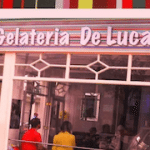 This authentic traditional italian ice-cream parlour is a real favourite amongst the locals of the trendy area of St James Street, just a minute from the big wheel. A wide range of flavours which they rotate and recreate constantly. Worth the short walk out of the town centre for. Fairly new on Brighton’s Ice cream scene having only opened last year, JoJo’s has already created quite a stir. Inspired by italian gelaterias from the 1960’s with a contemporary twist, it’s fun and vibrant inside with plenty of colour. 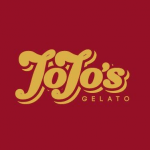 With ambitious flavours and toppings, JoJo’s on Western Road is a must visit. Traditional italian gelato is made in house daily.